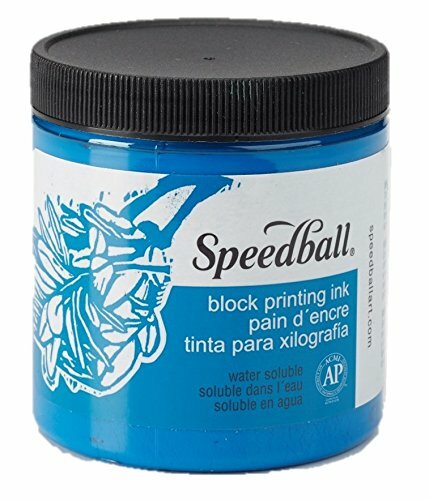 The Speedball Water Soluble Block Printing Ink is the industry leader and a favorite among artists and students. These premium printmaking inks are all ground and milled to the perfect consistency which create bold prints that dry to a rich, satiny finish. This ink is available in a wide variety of brilliant colors which include metallics and fluorescents ideal for block and relief printing. Use it on linoleum, wood, Speedy-Cut Easy, Speedy-Cut, Speedy-Carve and Polyprint. The block printing ink has nice tack which ensures even coverage and allows you to produce consistent, spectacular results every time. There is no messy clean up when using this block printing ink. When you are done with your project the ink will come right off you using soap and water. The Speedball Water-Soluble Block Printing Ink is safe for adults and children to use. It is ACMI AP Non-Toxic and conforms to ASTM D-4236. INDUSTRY LEADING PRINTING INK - This block printing ink receives rave reviews from artists and students for good reason. The wide variety of ink colors are all ground and milled to the perfect consistency which create bold prints that dry to a rich, satiny finish. INK HAS EXCELLENT TACK - This printing ink has a tack which ensures even coverage and allows you to produce consistent, spectacular results every time. QUICK, EASY CLEANUP - There is no messy clean up when using this block printing ink. When you are done with your project the ink will come right off you using soap and water. NON-TOXIC AND SAFE - The Speedball Water-Soluble Block Printing Ink is safe for adults and children to use. It is ACMI AP Non-Toxic and conforms to ASTM D-4236. If you have any questions about this product by Speedball Art Products Company, contact us by completing and submitting the form below. If you are looking for a specif part number, please include it with your message.